It’s not for nothing that Amazon Web Services, better known as AWS, are the no. 1 cloud infrastructure provider. While their pricing has remained constant,the number and types of services offered by AWS and their computing power has increased massively. You can start or stop using a product any time without any long term contracts and at the end of the month, you only pay for what you use. Find this out using Exelanz’s Cloud ROI Calculator. And if pricing isn’t enough for you, AWS new virtual server called the High-Memory Cluster Instance includes 88 EC2 Compute Units of compute capacity. Now we are sure your mouth just dropped open. Well it’s true. The best part is, AWS cloud infrastructure has been built to be the most flexible and secure cloud computing environment. 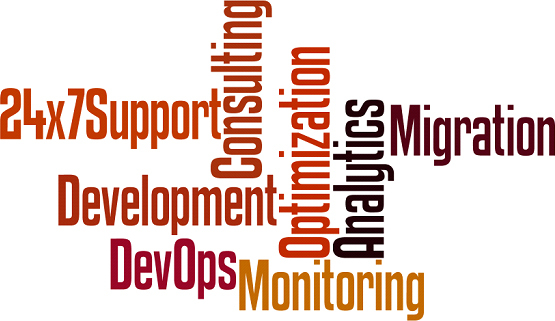 Customers can deploy applications and data quickly and safely. AWS offers a variety of cloud computing services which is implemented and managed by its Consulting Partners. For each service, you pay for the amount of resources you use. This is otherwise termed as utility style pricing model. The details of the pricing model are listed below. Pay as you go – No long term contracts or commitments are required. Instead of paying upfront for excess capacity, you can pay for only what you use and hence replace the upfront capital expense with low variable cost by. For compute resources,you pay on an hourly basis, that is, from the time you launch a resource till it is terminated. For data storage and transfer, you pay as per gigabyte basis. Our charges are based on the underlying infrastructure and services that you consume. You can power off your cloud resources when you are done and stop paying for them. Pay less when you reserve – You can invest in reserved capacity for some products. You pay a low upfront fee and get an extensively discounted hourly rate saving from 42% upto 71% depending on the type of your reserved capacity. Pay less per unit by using more – The pricing is tiered in case of storage and data transfer. The more you use, the less you pay per gigabyte. You can avail volume discounts up to 20% when you reserve more in case of compute. Pay even less as AWS grows– As AWS grows,they focus more on reducing data centre hardware costs, improving operational efficiencies, lowering power consumption and the cost of doing business. These optimizations and AWS’s substantial growth, results in savings that is passed on to customers in form of low pricing. Custom pricing – This for high volume projects with unique requirements. AWS Elastic Beanstalk – Provides an easy way to deploy and manage applications in AWS cloud faster. Apart from this, you can also consolidate all your accounts using Consolidated Billing and avail tiering benefits. With AWS’s growth, their pricing has remained fairly constant. You can try to estimate the cost of hosting a web application but it can be pretty challenging. A solution uses multiple features across multiple AWS products, as there are a number of factors and purchase options to consider. Hence the ideal way to predict costs is to examine the fundamental characteristics of each AWS product, estimate your usage and map the usage to prices posted on the website. 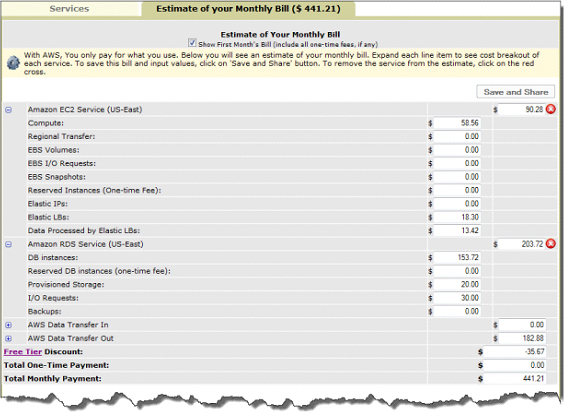 You can use AWS Simple Monthly Calculator estimate your monthly bill. The calculator provides per service cost breakdown and an aggregate monthly estimate. The calculator an also be used to see an estimation and breakdown of costs for common solutions. To make things easy for you, AWS has introduced a free usage tier to help you to get started. AWS new virtual server, High-Memory Cluster Instance, has been designed keeping speed in mind. The Cluster runs on two Intel Xeon E5-2670 processors, two 120 GB solid-state drives of instance storage and 244 GB of RAM. In-memory analytics including on SAP’s popular HANA platform and other scientific workloads, require data delivery to keep up with processing speed. Applications can read and write data faster from an in-memory cache or solid-state drives rather than from hard drives and thus computation is faster. The new Cluster instance is a part of AWS’s Cluster Compute family. Multiple instances are connected through a 10 GbE network for speedy server-to-server data transfer. The Cloud Harmony site provided a benchmark test in 2010 where Cluster Compute instances outperformed everything else in market. They have also been used to spin up clusters in order to compete with traditional supercomputers in terms of performance where they reached the 102th position among Top500 with a peak speed of 354.1 teraflops. Now some of you might say that AWS isn’t the only game in town, we got Liquid Web’s Storm cloud service that offers some high-memory and SSD-powered servers of its own at nearly $1.50 per hour which is less than what AWS charges. Yea sure and with the lesser price you miss out the 10 GbE backbone and the catalog of features that comes with AWS platform. AWS has highly secure data centers that utilize state-of-the art electronic surveillance and multi-factor access control systems. Data centers are staffed 24×7 by trained security guards and access is strictly authorized on a least privileged basis. Environmental systems are designed to minimize any sort of interruptions to operations while multiple geographic regions and availability zones enables customers to get going in case of natural disasters or system failures. 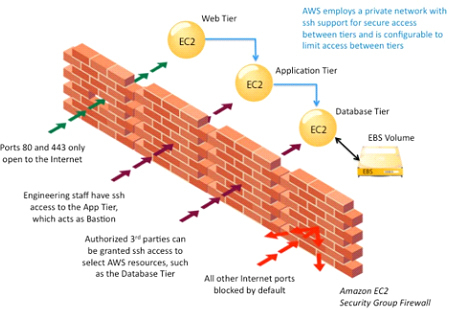 Secure access – Customer can establish secure communication sessions with AWS services by accessing points called API endpoints that allow secure HTTP access (HTTPS). Built-in firewalls – You can configure built-in firewall and hence control the accessibility of your instances. Unique users – AWS Identity and Access Management (IAM) tool enables you to control the level of access your users have to your AWS infrastructure services. Each user can have its own unique security credentials, removing the need to share passwords or keys. Multi-factor authentication (MFA) – Built-in support for multi-factor authentication (MFA) can be used with AWS accounts and individual IAM user accounts. VPN option – AWS Virtual Private Cloud (VPC) service adds another layer of network security to your instances by creating private subnets. It also adds an IPsec VPN tunnel between your home network and AWS VPC. Isolated GovCloud – Customers who require additional measures to comply with US ITAR regulations, can opt for an entirely separate region called AWS GovCloud (US). In this environment, customers can run ITAR-compliant applications and avail special endpoints that utilize only FIPS 140-2 encryption. CloudHSM –Customers who want to use Hardware Security Module (HSM) appliances for cryptographic key storage, can use AWS CloudHSM that provides a highly secure and convenient way to store and manage keys. To be sure that AWS employs right security controls, you can check out the third-party certifications and evaluations that AWS has undergone. AWS has been validated as a Level 1 service provider under the Payment Card Industry (PCI) Data Security Standard (DSS) and has achieved ISO 27001 certification. We have been successfully evaluated at the Moderate level for Federal government systems and also at DIACAP Level 2 for DoD systems. We also undergo annual SOC 1 audits. To view the applicable compliance reports, you can contact your AWS account representative. Since you are building systems on top of AWS cloud infrastructure, with AWS managing the underlying infrastructure, the security responsibilities will be shared. Nevertheless you can secure anything you put on the infrastructure, starting from your AWS EC2 instances to the VPC subnet within which your instances reside. Thus there are several security decisions to make and various controls to configure. With big data and analytics applications picking up speed and moving from batch to real-time clouds, clouds that can provision demanding users are in a good position. So what are you waiting for? Utilize the Free Usage Tier and get started with AWS today! Exelanz is a certified Amazon Web Services partner. 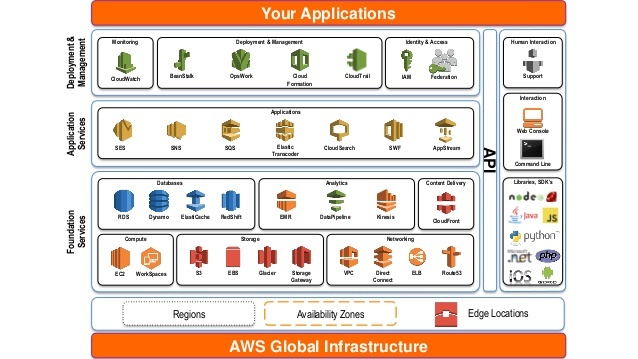 Our engineers have been using AWS since its beta period in 2006, have deep knowledge of AWS provisioning, infrastructure management and cloud security.We currently manage the AWS infrastructure of dozens of businesses including start-ups and large enterprises, and offer a complete suite of AWS services including consulting, hosting, custom software development, application migration, infrastructure management, monitoring, support and security. Are you currently using or planning to use AWS? Ask us about ‘AWS reseller benefits’.